During the first trimester of pregnancy, one of the worst symptoms often experienced by most women is morning sickness. For some, it can be debilitating and a challenge to stay active throughout the day. For those who already have children, there’s often a struggle with taking care of the kids while suffering for several hours. To keep the kids busy while also tending to your own needs, there are a few methods to getting through the day. 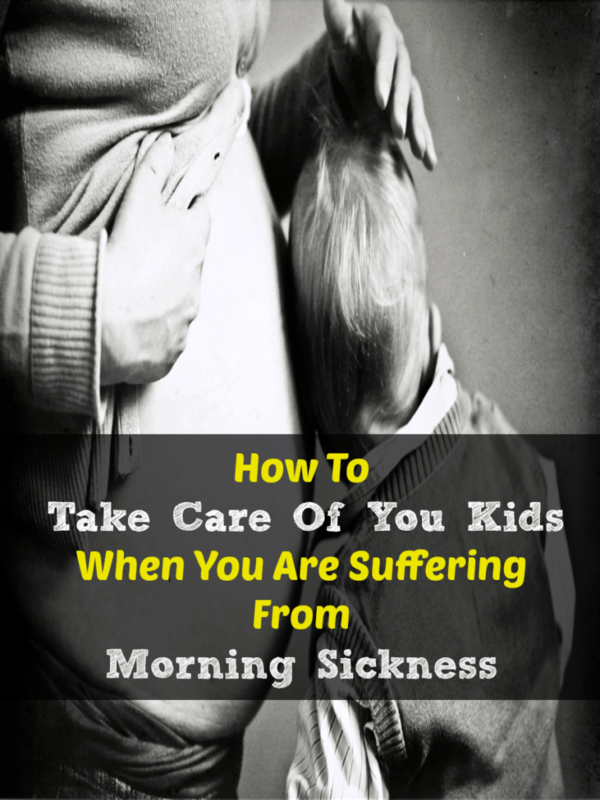 Taking care of your kids when you are suffering from morning sickness. One of the easiest ways to deal with days where you experience major morning sickness is to hire a babysitter to come over for a few hours. This will ensure that the kids get fed, any messes are cleaned up and the children don’t become bored without your company. If you have family or friends nearby willing to help, you might not have to spend the extra cash for a little help. When you can’t do anything but lay on the couch or run to the bathroom, it’s best to put a movie on that will keep the kids occupied while you try to recover. It will allow you to stay in one place and even shut your eyes for a few minutes. Don’t be afraid to establish quiet time for a few hours where your children can read, color or work on a puzzle while you rest. It’s a better alternative than turning on the television and will allow you to cope with the nausea. To stay in one place and prevent having to get up every few minutes, keep your kids in one room where they can play and make a mess while still having your supervision. You can easily sit in the corner while keeping an eye on their activities. Your kids will likely stay entertained if you introduce new toys to them. Try pulling out a new item once a day or every few hours to keep them busy. It might be a good idea to swap toys with other families in your neighborhood too to save money and keep the kids entertained. For older children who are beginning to learn numbers and spelling, use activity books for a great way to help them develop while you can lay down nearby. How did you cope with morning sickness when you had other children to take care of? Guest post written by Anita. Anita is a freelance writer from Denver, CO. She mostly writes about home and family, finance, and business. When she isn’t writing, she enjoys spending time with her family and reading a good book. Those are some great tips. I remember morning sickness and it was not fun. Morning sickness can be awful! I think there is nothing wrong with hiring someone to help out a little bit. I think putting a movie on sounds like a great idea. Kids get so distracted so easily by any type of tv LOL! Stacey- Travel Blogger recently posted…Foster Farms Frozen Chicken Products – Instant Dinner or Party! This seems like invaluable info for those who are going through or may be going through this. Thanks for sharing. Oh man I could have used this about 5 years ago. This is great knowledge, I will pass on. I did a lot of “putting a movie on” simply because I couldn’t afford to hire a babysitter. Great tips! Really great tips! Even the simplest everyday tasks can seem like competing in the Olympics when you’re sick, never mind keeping up with another little one running around, or more! Great tips! A new movie will definitely occupy the kids for a bit! Awe these are such good tips. I will have to save them for later! New toys definitely help keep them occupied allowing mom to focus on dealing with her sickness. This is definitely something I had a problem with every single time. I was able to drive everyone to school and then come home and spend the morning puking. Thankfully, my office knew it was bad and let me come in 30 minutes late every day. I had very severe morning sickness this last time and definitely had to employ a lot of those methods!